This is the best homemade root beer recipe. I grew up in rural Wisconsin, and when we craved root beer we just went to the local A&W and ordered a gallon. 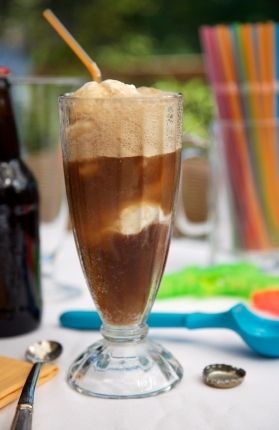 Cold root beer on a hot day is hard to beat; adding it with homemade vanilla ice cream as a root beer float...pure heaven. Boil 1 gallon of water with the sugars; cool and stir in the root beer extract. Pour into a large cooler. When ready to serve, add the gallon of chilled club soda and 1-1/3 gallons of cold water. Next slowly add the dry ice and cover loosely with the lid. Let the mixture brew for about 1 hour. Leftover root beer can be stored in gallon jugs. This free drink recipe will save you some money. Just put two scoops of vanilla ice cream in a tall glass and fill with root beer.